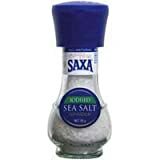 Australian – Saxa Iodised Sea Salt Grinder 90g. 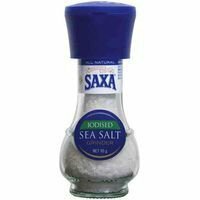 Australian – Saxa Iodised Sea Salt Grinder 90g. , selling for $12.95 brand new. Manufactured by Saxa. There are 1 units left brand new. SAXA pre-filled Grinders add a touch of sophistication to the dinner table and their size makes them handy for outdoor occasions such as barbecues and picnics.